Tropical Storm Harvey has forced a Houston television station to evacuate to higher ground as rising floodwater overtook their offices. The station lost its broadcasting signal Sunday morning but was working to get back on the air. 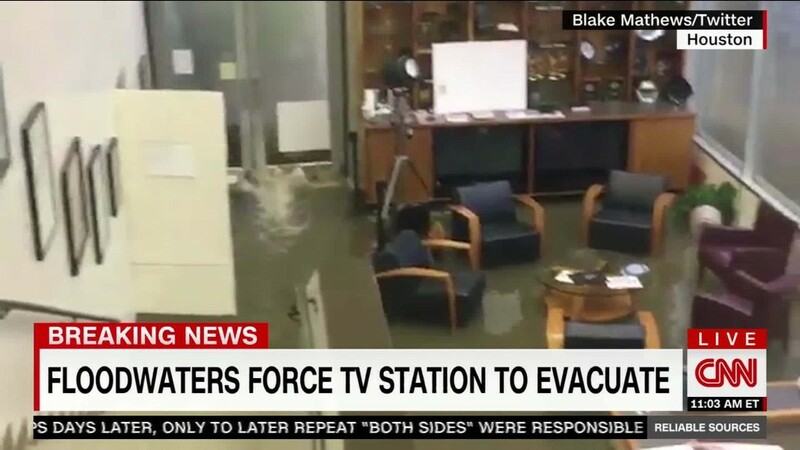 Reporters and editors at KHOU, a local CBS affiliate, on Sunday tweeted photos and videos of flooding inside the station's lobby. Bishop said on Twitter that crews found a "temporary home" at the Houston branch of the Federal Reserve Bank. As the station evacuated, reporter Brandi Smith anchored coverage from outside on city roadways. Smith also posted a video on Facebook of rescue crews pulling a truck driver from a semi that had become enveloped in water on a highway. "I flagged them down, told them about the situation, and now they are here, saving this man's life," Smith says in the video. The station's journalists continued to report the storm, posting video and reports to social media and the web. A nationwide special report by CBS News relied on KHOU reporters who were able to connect with the CBS control room in New York. "We are continuing to keep people of Houston informed and safe during this catastrophic storm," the station tweeted. "We will get through this together, Houston." During the devastating Hurricane Katrina in 2005, a Fox network affiliate in New Orleans, WVUE, was taken off the air for two weeks. WVUE was forced to move to a sister station in Mobile, Alabama to continue broadcasting, the New Orleans Times-Picayune reported at the time. The newspaper said flooding from Katina "swamped" the station's transmitter and filled its offices with "waist-high water."